Overview Parasitic Jaeger Dark Morph: Medium jaeger with brown body, darker cap, and pale underwing patches near tips. Pale form has white underparts with brown breast band; intermediates between dark and light morphs occur. Diamond-shaped tail has elongated, pointed central feathers. Black bill, legs, feet. 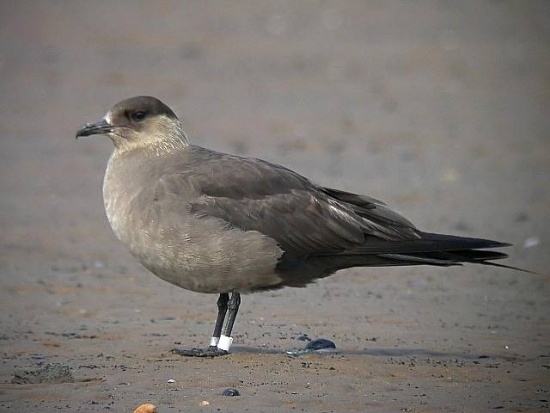 Range and Habitat Parasitic Jaeger Dark Morph: Breeds on coasts of Alaska, as well as coastal and inland tundra regions of northern Canada; also found in Greenland, Iceland, Scandinavia, and northern Russia. Spends winters on tropical oceans of the southern hemisphere. INTERESTING FACTS The Parasitic Jaeger takes its name from the two main strategies it uses to acquire food. The first word of the name refers to this species’ habit of pursuing gulls and terns and forcing them to drop their food. Breeding pairs defend large territories where they often cooperate in hunting birds, eggs, and rodents. The second word comes from the German word for hunter, alluding to the fact that this bird will at times find its own food by preying on small birds, eggs and even small mammals. A group of skuas are collectively known as a "shishkab" of skuas.